Hattie-Grace has settled into a great one afternoon nap schedule. She wakes around 7, and naps anywhere from 12:30/1- 3/4, depending on nighttime sleep and our activity level. She goes to bed between 7:30-8. Hattie-Grace is a great meal eater. We have enjoyed lots of pears and apples this month. HG is wonderful at eating anything we have for dinner, as long as she can chew it :). Peanut butter is still a favorite, along with cucumbers. HG took her first steps on 11/5 at youth group with a bunch of sixth grade girls and Bethany, the student ministry intern. She has become more confident in her walking ever since. We have encouraged her to walk with her stuffed animals, hats, phones and power cords :). We are so excited to see progress in this! She loves balls and will roll them or kick them to us. HG is using a fork to eat most things, and is slowly mastering the spoon with yogurt or quinoa salads. She can put straws into small holes, and colors with crayons. 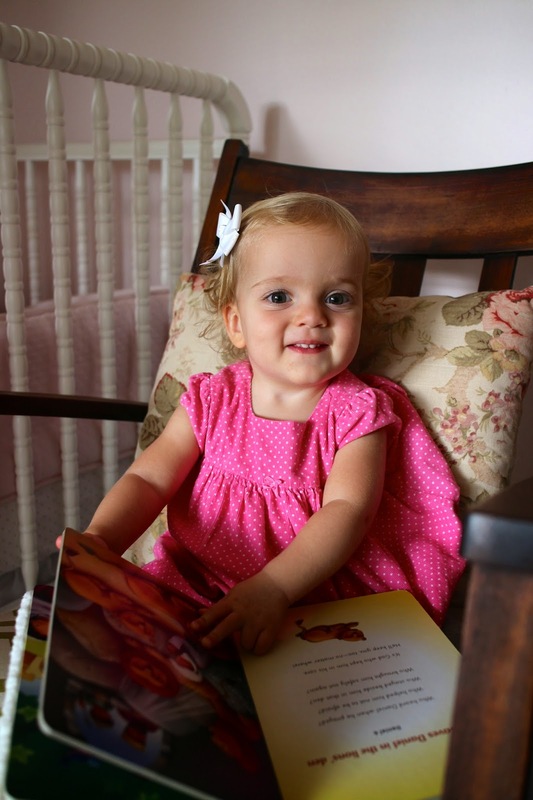 She loves turning the pages of board books, magazines and regular books. She stacks blocks and connects mega blocks. HG will try to say lots of words if we ask her too. She can name various body parts, and loves pointing out our eyes, ears, nose, mouth, hands, fingers, toes, feet, hair...Due to no shave November, she knows what a beard is as well. She babbles all the time, and loves when we sing to her. Her favorite song is Wheels on the Bus and asks for it by moving her hands like the wheels. She is learning more animal noises as well. 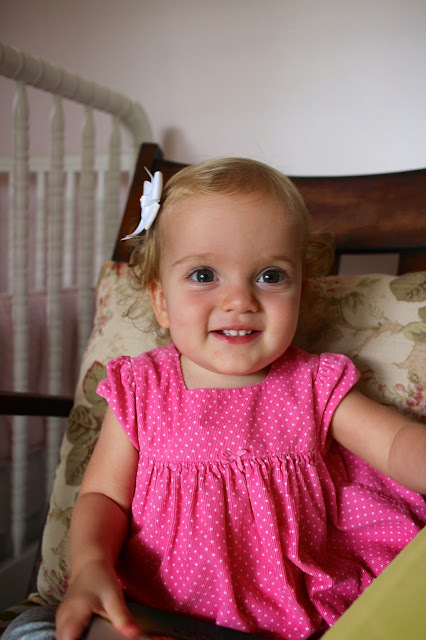 - Hattie-Grace was the only baby in the nursery to not cry on Sunday morning, yet she fussed when it was time to go. - HG loves figuring out how things work. She observes everything. We thought we were safe with the Halloween candy in a dish on the coffee table, until one night she watched a friend unwrap a sucker and eat it. Now, she will only try to unwrap the suckers. Thankfully, she does not like how they taste...yet. - One of her favorite activities is clearing out any cabinet in our house. - She loves being around other children and cheers when I tell her we are going to church. - Yesterday, Hattie-Grace threw her first full out fit. I told her that it was library day, and when we got to the library, it was closed because it was Veteran's Day...oops! I told her we couldn't go to library time with Ms. Debbie because the library was closed. She immediately started crying and cried the entire way home. The big, splashy tears kind of cry. This is incredibly rare for her, and it blew me away that she fully understood that we were planning to go to the library and then couldn't. All was made right with a good swing and bike ride outside. You are such a big girl, learning to walk this month. When I hold your hand, you no longer rely on me as much to take each step. I just know once you become more confident, you will be running! You are spunky and sweet. You are not easily upset, and never want to miss out on a good time by sleeping. You are growing, learning and changing so fast right now. Others always comment on your long pretty eyelashes and your beautiful big eyes. You are truly beautiful, yet I pray that the Lord continues to grow your heart and spirit into a true gem shining His love to others. You are our pride and joy!